Looking for a great swanky restaurant for a romantic date night? The Savannah Chop House in Laguna Niguel features contemporary American variety of steaks, chops, seafood and other Southern dishes that are sure to tempt all appetites. Invited out for a night out with some of my favorite social media friends, I couldn’t wait to grab a cocktail. I was looking forward to some amazing food and a chance to socialize with some awesome people at a great Southern California restaurant. Located in Laguna Niguel, Savannah Chop House overlooks the beautiful Ocean Ranch community in Orange County, California. With a chic ambiance and a warm and welcoming décor of dark wood, overstuffed booths, soft lighting and stone fireplaces it is the perfect place for a small intimate dinner or casual get together. Our group assembled out on the Sunset Terrace overlooking Ocean Ranch with the ocean in the distance. It was a great place to chat and snap away. Have you ever been to a location with 50+ social media influencers? Warning, you’re not allowed to take a bite of the food until everyone has gotten in their award winning photo. First, a fabulous mimosa. 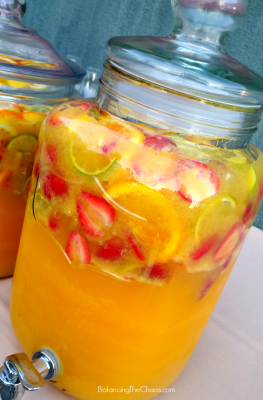 A beautiful blend of flavors, this cocktail was the perfect way to start off the evening. 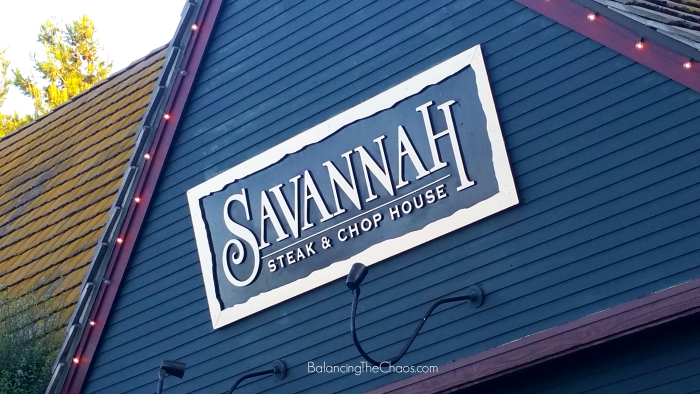 We were introduced to Philip Robertson, the General Manager of Savannah Chop House, who shared the recent changes and new features at the restaurant. During the holiday season, the chop house is host to more than 50 parties since the private dining room hosts 60 and the outside terrace seats 100. Also a great spot for engagements, Philip shared that one table in the corner of the terrace overlooking the valley below has hosted 15+ proposals. Executive Chef, Chris Tzorin was on hand to greet us as well. Employed at Savanna Chop House since 2012, he shared his drive and love for becoming an excellent chef. Starting at the bottom washing dishes for his father while paying back a debt, he was inspired and encouraged to follow in his father’s footsteps. Now his goal is to provide guests with a unique, modern culinary experience, which absolutely shined in his menu selection. Out came the appetizers. 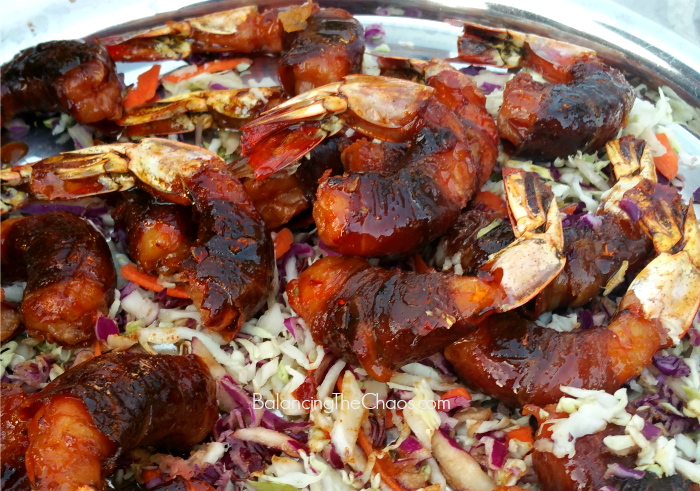 I was excited to sample the Grilled Prosciutto Wrapped Shrimp since I just LOVE shrimp. Grilled to perfection, the prosciutto was caramelized and made a perfect wrap, sealing in all of the amazing flavor. 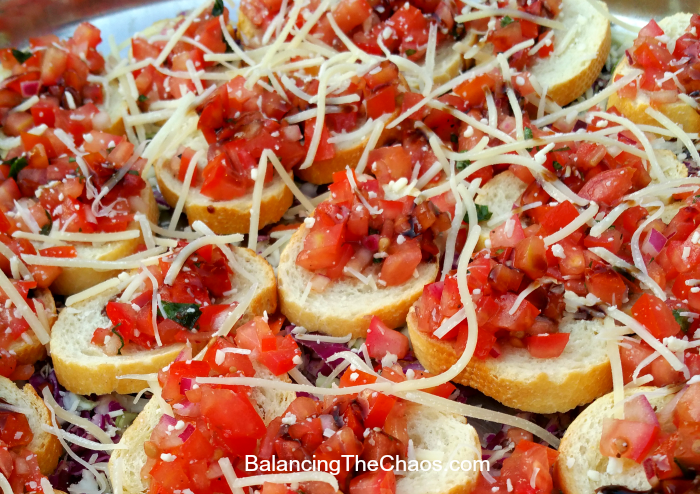 My favorite appetizer of the evening was the Bruschetta, Savannah’s signature recipe. 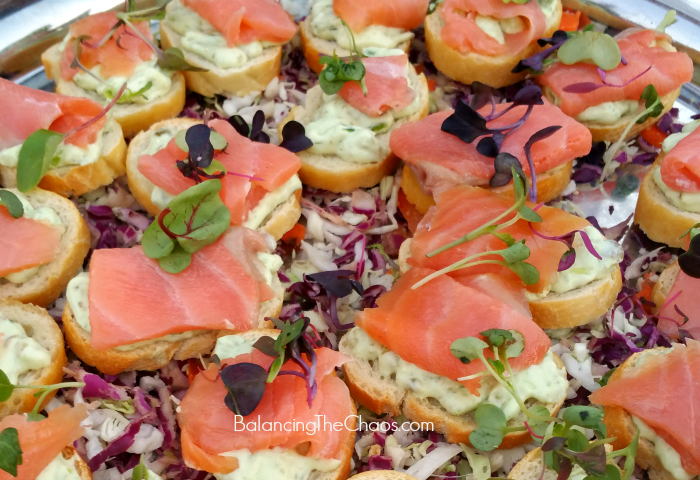 The Smoked Salmon on a Toasted Point had a delicious blend of flavors with the salmon and a black pepper sour cream. On to our actual sit down dinner. We were served a beautiful 1st course appetizer of Tempura Stuffed Zucchini. 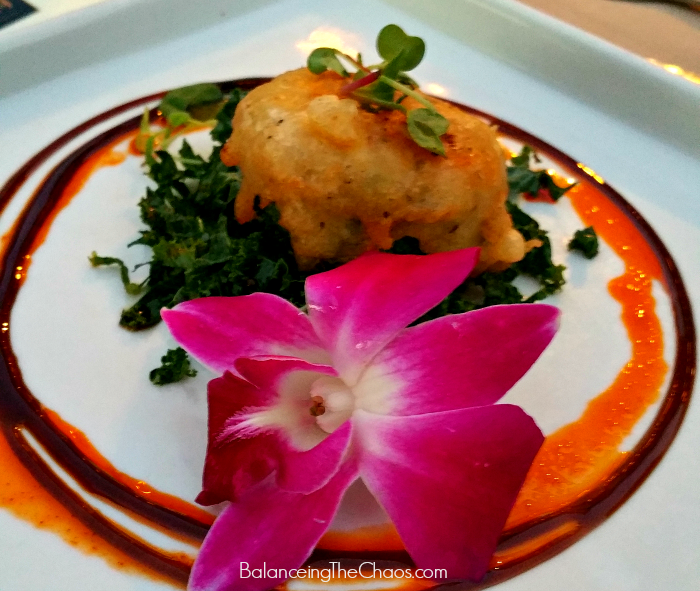 The zucchini was stuffed with herb goat cheese and sundried tomatoes plated with mixed baby greens, a beautiful edible orchid and ponzu sauce. 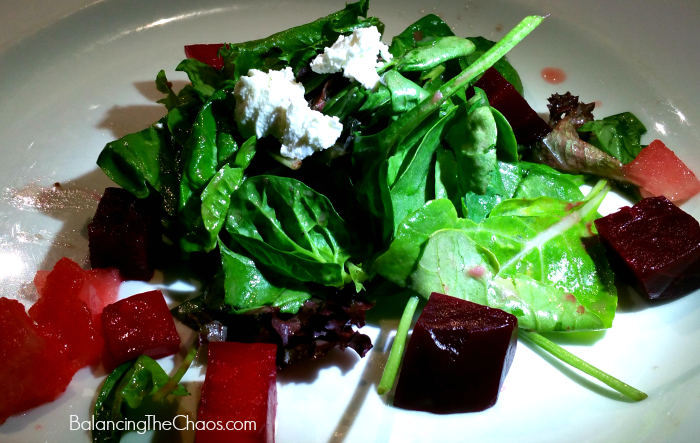 For the second course, we were served either a Classic Caesar Salad or a Watermelon Beet Salad, which I had. A refreshing twist with the watermelon and beets, not something I’d typically order, however, I really enjoyed it, especially with the candied walnuts and the light herbal vinaigrette. Next my favorite part of the evening, Surf and Turf. Have I shared that I’m a shrimp/scallop lover? Well Executive Chef Tzorin and his staff prepared it to perfection. 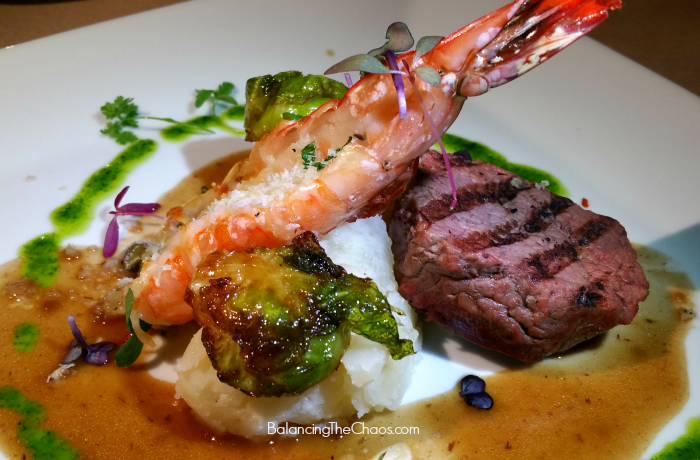 A gorgeous display: a fillet medallion and a shrimp scamp atop a mound of mashed potatoes, brussel sprouts and a Cabernet reduction. It was as beautiful as it tasted! I was delighted to be served the Strawberry Shortcake. 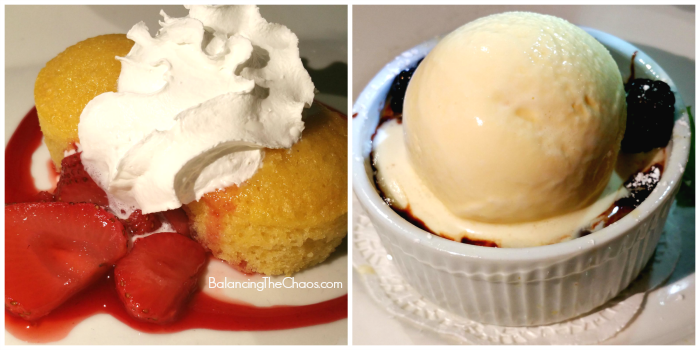 With mini vanilla cakes, strawberries and whipped cream, it was the perfect end to my delicious evening. My friends truly enjoyed the Flowerless Chocolate Cake that was hidden under a heaping scoop of vanilla bean ice cream, berries and chocolate sauce. Thanks to our wonderful friends at Gigasavvy for setting up this amazing evening of fabulous food, delicious desserts, friends and fun. I’m looking forward to our next adventure.